Tameeka Hunter is the Director of the Disability Resource Center at Clayton State University (CSU), which provides accommodations for students with disabilities. Prior to her employment with CSU, she served for six and a half years at the Georgia Institute of Technology (Georgia Tech) as a Disability Services Specialist. Before her role at Tech, Ms. Hunter was appointed as the Disability Affairs Coordinator for the City of Atlanta, Mayor's Office. 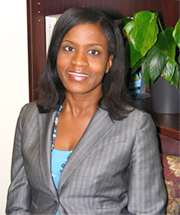 Ms. Hunter holds a graduate degree in Rehabilitation Counseling, from Georgia State University, which provides her comprehensive knowledge of the medical aspects of various disabilities, as well as extensive knowledge of therapeutic counseling interventions. She is also a nationally Certified Rehabilitation Counselor. She is currently a Doctoral Candidate, PhD Counselor Education and Practice, with a Rehabilitation Counseling cognate. Ms. Hunter has such proven leadership skills that she was appointed to the Georgia Governor's Council on Developmental Disabilities (GCDD) in 2002 by Governor Barnes, and reappointed in 2005 by Governor Perdue, was named the 2008 C. Anthony Cunningham Council Member of the Year, and was elected 2008 Vice Chair of the Council. Considered a leading authority in the field of disability awareness and advocacy, Ms. Hunter is a sought-after presenter, author, and trainer. She was selected to appear in the Georgia Secretary of State Accessible Voting video; she trained Delta employees in the Delta Airlines' Disability Awareness video, issued the keynote address for the Centers for Disease Control (CDC), served as corporate trainer for the diversity staff at Home Depot Corporate Headquarters, and was a featured speaker in three State-produced Public Service Announcements involving disability issues. In addition to her leadership and advocacy efforts, she is in the process of having her fifth disability-related work published. Ms. Hunter is an active member of Delta Sigma Theta Sorority, Inc. She enjoys reading, cooking, travel, and cultural events in her spare time. Ms. Hunter has a congenital disability, Cerebral Palsy, and has dedicated her life to serving the disability community.